The current outbreak, which began in 1992, saw its rate of spread accelerate in 2006, mainly in the regions of Côte-Nord and Saguenay ̶ Lac-Saint-Jean. From 2006 to 2014, the infested area grew from 50,000 hectares to more than four million. In the last three years, the infested area increased by nearly 62%. And 45% of it is considered to be in a state of severe defoliation, where most of the trees have lost their foliage throughout the length of the crown. 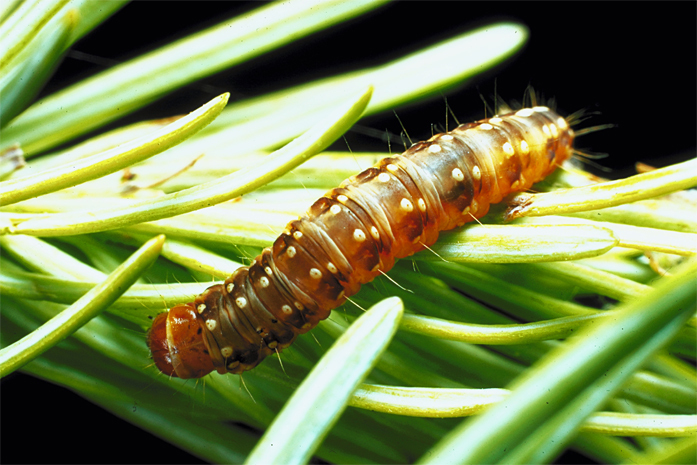 A mature spruce budworm caterpillar measures about 20 to 30 millimeters and is a voracious eater of balsam fir and white spruce. The larva emerges from its silken hibernacula in the spring at only 1.5 millimetres long and feeds on flower pollen as they wait for buds to open. When new shoots appear, they form a cocoon-like shelter and feed off the shoots until they mature into larger caterpillars. These mature budworms are responsible for 85% of all defoliation. Over three to five years, an infestation will kill the crown of the tree, if not the entire tree. Dead trees can still be harvested and used for pulp, but it takes more of this infected wood to make a tonne of newsprint, and the process is more expensive. The poor quality fibre from the infected trees must be bleached to remove stains from the budworm and ensure an acceptable paper quality. Harvesting costs are higher because we have to pay more to harvest lower quality fibre. This is also the case when it comes to processing and production. Insects, fire and disease naturally threaten the boreal forest, but the greatest threats are these recurring widespread spruce budworm outbreaks. Since scientists marked an accelerated rise in the budworm population in 2006, some four million hectares of Quebec forest have been affected – that’s an area the size of Switzerland. Outbreaks tend to occur every 20 to 40 years and the last major outbreak, which lasted from 1970 to 1987, adversely affected 58 million hectares of boreal forest. For Quebec alone, it was estimated to have caused wood supply loss equivalent to 20 years of harvest. According to research from Natural Resources Canada, there is evidence to suggest that spruce budworm populations increase first in areas where natural enemies are unable to curtail increases in the local density of budworms. The reproductive success of budworms then increases and migrating moths may subsidize local populations, leading to a rise in budworm populations over a very wide area. SOPFIM, Quebec’s forest protection agency, is studying what part climate change may play in influencing an outbreak. But it is likely that weather interacts with forest conditions to determine where, rather than when, outbreaks occur. It is generally understood that an outbreak ends when the amount of damaged trees can no longer support the budworm population. This is often combined with a rise in mortality caused by many natural enemies like birds or spiders but the most important are parasitoids. The different species attack different stages of the budworm (the egg, pupae, or larger larva). What’s being done about it now? Using a biological insecticide to directly control the spread in an area is one tactic that has been used sparingly. And it’s expensive. Application costs have ballooned from $4 to $10 per hectare in the 1970s and 1980s to more than $65 per hectare as of 2012. So these are generally reserved for high value or high risk stands. Most of the work right now is focused on carefully monitoring the budworm population to watch for populations fluctuations. Using a network of permanent observation stations, researchers can measure population sizes and can also predict short- and medium-term trends. New early intervention methods that target infection epicenters to prevent large scale progression have been proposed. Stand resistance to the budworm can also be enhanced by increasing species diversity and carrying out commercial thinning in outbreak-free areas.